After picking the mat and the frame, the next important decision to make is what type of glass or glazing to use for your art piece. Framagraphic offers a wide selection of framing glass to protect your art, each with different advantages. Some things to consider when deciding on what glass to chose are: Where will the piece be hanging? Will there be a lot of sunlight in the area? Does the framed piece have important monetary or sentimental value? Is the most economical of the choices for glazing. It has a natural moderate UV-blocking protection, which is perfectly fine for framed pieces that are not in direct sunlight or bright rooms. Over time, there is the possibility that fading could occur with regular glass. Faded pieces tend to have the paper ‘burned,’ resulting in washed-out colours that have a blue-tint. It is important to make sure that these framed pieces stay away from sunny rooms. 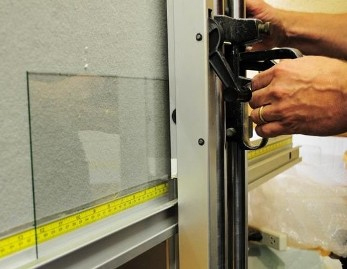 Is etched to reduce the reflective quality of the surface of the glass. The ‘fuzzy’ surface scatters the light, creating a matte appearance. Unfortunately, the surface markings also tend to affect visibility of the artwork. The framed pieces appear ‘fuzzy’ from certain angles, because the scattering of reflected light diffuses the quality of detail and colour. This glass is best suited for bolder pieces. Can come with or without UV protection, and has even better clarity than regular glass, as it does not have a natural tint to it. Acrylic is a plastic, which makes it lighter in weight than glass, and should never break. It is best for large and oversize pieces, or for any frames that will be shipped. Acrylic is easily scratched, so it is important to make sure that nothing comes in contact with the surface. Is designed to focus on preservation. With 99% UV protection, this glass filters out essentially all of the damaging UV rays, offering the best protection for your framed piece. Conservation Clear is also available in non-glare. Is a newer type of glass developed by Tru Vue, and is almost invisible. It has the advantage of both UV protection and anti-reflective properties. 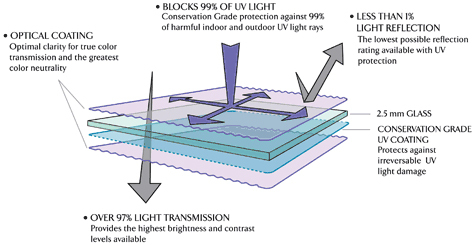 UltraVue has 65% UV protection as well as a non-reflective coating, as is common with prescription eyeglasses. The coating, unlike the etching used for non-glare, does not affect visibility. See the difference between regular glass and Ultra Vue glass here. Is best suited for investment pieces, or pieces with historically important significance. Museum glass offers the best of both worlds: 99% UV protection (like Conservation Clear), as well as a non-reflective coating (like UltraVue). Museum glass offer the highest quality of conservation for your framed piece, with the enhanced visibility of a non-reflective surface. Framagraphic is also happy to offer glass replacements. Accidents happen.